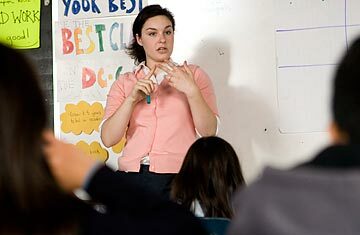 Elizabeth Venechuk, a third grade teacher at Powell Elementary School and Teach for America participant, teaches a math lesson in Washington in 2008. In 1989, when Wendy Kopp proposed the idea in her senior thesis at Princeton of quickly training outstanding college graduates to teach in high-poverty schools for at least two years, her adviser told her she was "quite evidently deranged." The comment has become legend since Kopp, unfazed, went on to launch Teach For America after she graduated, and on Saturday more than 10,000 of the nonprofit's alumni will gather in Washington to celebrate its 20th anniversary. Kopp ultimately earned an A on her thesis, but when it comes to learning from her organization's experience, the education field deserves a big, fat F. Over the past two decades, Teach For America (TFA) has grown from a scrappy start-up to a national corps with an annual budget of $212 million and a staff of 1,400. Along the way, it has generated a great deal of research about how to improve the teacher training and selection strategies that are commonly used today. Yet the reaction from the education establishment remains one of intense hostility, which echoes through state capitals, Washington and even the courts, where lawsuits have been filed to curtail the use of TFA teachers. 1. TFA is just a résumé booster for Ivy League dilettantes who want to become bankers or lawyers. While it's true that TFA got its start recruiting at Ivy League schools, today only two Ivies (Harvard and Cornell) are in the top 10 TFA-teacher producing schools, a list that now includes the universities of Illinois, North Carolina, Texas and Wisconsin. About a third of TFA teachers are people of color. The breakthrough innovation of Kopp's group isn't its ability to recruit smart kids at the most selective schools, but rather its ability to find and train great teachers from a wide variety of schools. 2. The research is mixed about whether TFA teachers are effective in the classroom. Pretty much every article about TFA states the boilerplate assertion that the research about its effectiveness is "mixed" or "inconclusive." Actually, that's only true if you think the best way to consume research is to literally pile all the different studies up and see which pile is higher. Again and again, the most rigorous studies show that TFA's selection process and boot-camp training produce teachers who are as good, and sometimes better, than non-TFA teachers, including those who have been trained in traditional education schools and those who have been teaching for decades. "The weight of the evidence suggests that TFA teachers as a whole are at least as effective as other teachers in the schools they end up in," says University of Washington economist Dan Goldhaber, one of the nation's leading researchers on teacher effectiveness. Another solid indicator? The marketplace. Superintendents and principals, who are on the hook for results, can't get enough TFA teachers. But it's worth noting that while the TFA corps overall turns in strong results, that doesn't mean all of its teachers can walk on water. Some of them turn out to be total duds. One recent example: when then-schools chancellor Michelle Rhee (herself a TFA alumna) told principals in Washington to get rid of low-performers as part of a budget reduction measure, there were some TFA teachers who got booted as a result. Being better on average doesn't mean universal excellence. 3. TFA teachers don't stay in education long enough to make a difference. Interestingly, TFA's strategy doesn't emphasize making a career out of teaching. The organization hardly discourages it, but believes that transforming America's schools requires committed leaders in a variety of sectors and roles. Fifty-two percent of its alumni remain in teaching after their two-year commitment, and 67% still work fulltime in education in one way or another. That includes 553 principals or school district leaders, 548 school-district and state "Teacher of the Year" winners, and a National Teacher of the Year as well as politicians, nonprofit leaders, foundation officials and consultants. My nonprofit firm, for instance, is full of them  one of my partners helped launch TFA  and remarkably that doesn't make us unusual among our peer organizations. 4. TFA is just a drop in the bucket and not scalable. That depends how you look at it. As you read this, there are about 8,200 TFA teachers teaching a half-million students in places like Los Angeles, Houston and the Mississippi Delta. In fact, Kopp's organization trains more teachers annually than any other single institution. And at its current pace, TFA will have 100,000 teachers and alumni by the time it celebrates its 30th anniversary. Meanwhile, the organization's data show that its teachers' effectiveness has increased as the corps has expanded, a noteworthy accomplishment. On the other hand, the U.S. has more than 3 million public school teachers, so while the lessons drawn from TFA's methods can be replicated, no single TFA-like organization can address the entirety of the education labor market. 5. At a minimum, TFA shows you don't need much training to teach. In practice, TFA provides more training and support than is commonly assumed. Although the initial boot camp, called "the Institute," lasts just five weeks, TFA has developed an elaborate system of professional development and performance metrics in the regions where it operates. And while we know that TFA's selection model works well, we don't know how much more effective it would be in tandem with an even more robust training regimen. The performance of TFA teachers should be a wake-up call for the nation's teacher-training programs, but it's hardly the last word on how to train teachers. See 21 ways to serve America.